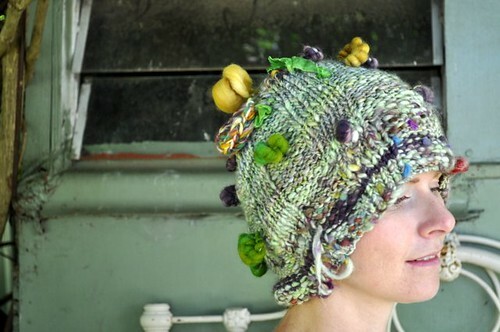 'vegie garden' artspun knit beanie, originally uploaded by wooldancer. I gravitate to my growing stash of fibre tools : knitting needles, crochet hooks, looms etc and let inspiration strike for what the yarn is to become. 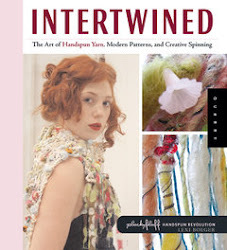 I usually work backwards, like reverse engineering, gaining ideas from the textures & colours of the handspun. I had the idea for this yarn after receiving the beautiful handdyed fibre from Cindy, www.studioloo.com, quite a few months back. The colours simply sprouted a Spring theme, and i began gathering add-ins. Included in a package from Lacey, www.moonrover.etsy.com, was the perfectly coloured needlefelted wool 'leaves' which became the coil vegetable-esque forms. I also found a lovely icord my 5year-old daughter had knit on her french-knitter.. she loves to collect scraps of yarn i leave around the house to knit. It was perfectly matched to suit the theme for this yarn, so I spun it right in. 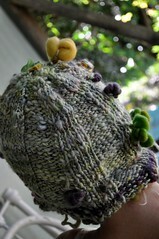 I have this beanie now for sale at The Nook, Leura, NSW. I hope to be adding more beautiful noggin-warmers to this collection soon. missed your beauties a long time! Wish I could get my daughter to sit still enough to do some french knitting. oh she will get there.. those little nimble fingers are so busy, and they will soon-enough find their way towards making loops of loveliness ;) My little ones really only came to it from age 4&half.